The heli accessible terrain found in the Chugach mountains of Alaska is truly unique and utterly amazing. While some of the steepest and sickest ski and snowboard lines can be found here, the Chugach has something for everyone. From 50 degree steeps to 5,000 vertical foot, 30 degree glacial powder runs a half mile wide! You’ll be skiing and boarding runs that are up to 5,500 vertical feet of untouched powder. ASG has heli accessible terrain that matches your desires. All within a short flight from base camp. The length of each run varies depending on the location of drop-off and pick-up and where we are in the range. Runs can be anywhere from 2,000 – 5,000 vertical feet. Every run is different and we rarely ski the same run twice in any one week. 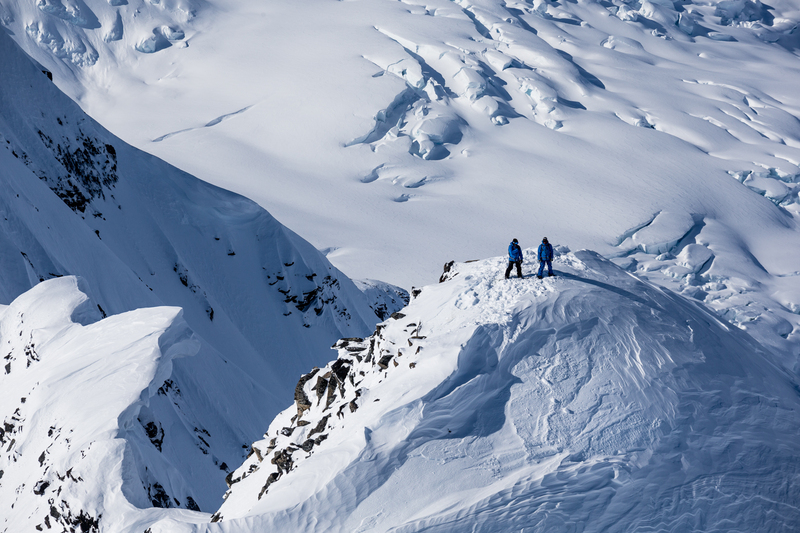 How does heli boarding and skiing in Alaska compare to Canada? The terrain we ride in Alaska is very different than what you will find in BC. Not only are the zones much bigger, but the timberline is also much lower (about 2,000ft) meaning nearly all of the terrain we ride is high alpine (no trees). Our massive terrain features include; long ramps, giant bowls, spines, natural halfpipes, wind waves, extensive couliors and massive glaciers separated by dramatic rock formations. It’s hard to describe the scale of our accessible heli terrain, until you have ridden in the Chugach. Unlike the group boarding and skiing that is done in Canada, at ASG we only ski in groups of four to six, and due to the size of the lines and hazards present, we ride one person at a time. This allows the guide to focus on one client at a time, thus reducing the full group to these hazards. There’s an energy here bigger than words can describe. The snow is incredible. I mean it’s completely mind blowing the stuff we can ride. I had the best turns of my life!